Bialetti Brikka is for you, if you are looking for an espresso maker that can give you high quality and rich flavor of espresso with crema. Brikka is a stove top espresso maker. This espresso maker has two sizes. These sizes are: 2 espresso cup (3.0 fl.oz / 100ml) and the 4 espresso cup (6.7 fl.oz / 200ml. So, whenever you want to drink espresso, you just have to choose from the two sizes available. With the Bialetti Brikka, anyone can enjoy a great tasting coffee everyday without leaving the comfort of their kitchen. The system of this machine is the product of passionate technological and qualitative study of Bialetti. Bialetti was founded by Alfonso Bialetti in year 1919. This company started when Alfonso opened a workshop in making semi-finished aluminum products at Crusinallo. Because of motivation, Alfonso Bialetti then changed his workshop into a studio for designing and producing finished goods. This studio’s name is Alfonso Bialetti & C. Fonderia which is located in Conchiglia. 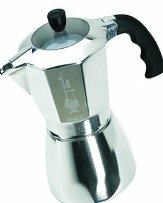 In 1933, Alfonso Bialetti invented the Moka Express. The Art Deco design of his son Renato helps the company to become the leading coffee maker manufacturer in Italy. The symbol of Bialetti Company is the “Little man with a moustache”. This symbol was created by Paul Campani in year 1950s. It is said that Bialetti Brikka is a fixture to many Italian kitchens. This machine is also called as “the poor man’s espresso machine”. The reason for this is because the machine can brew a strong espresso coffee economically and quickly. This product develops the making of espresso and the people’s drinking experiences. This is because the espresso it produces has an intense creamy flavor. With this, espresso became the base of other drinks such as cappuccino, lathes, etc. Over the 250 millions of coffee maker machine that has been manufactured, Bialetti pot is the world’s top coffee brewer. This machine was recognized worldwide due to its octagonal shape and the way it makes espresso. Because this machine’s design is iconic, it has been displayed in modern museums like the Science Museum located in London. In addition, Bialetti Brikka is the most copied coffee maker machine and considered as one of the staple equipment in the peoples households. Like any other coffee maker, Brikka has some unique features. Features like: equipped with Bialetti's Brikka System, transparent lid, measuring cup included for proper measuring, it uses gas, electric and ceramic cooker, it has two sizes, and it is definitely made in Italy. Moreover, this coffee machine has some positive product points. 1. You can use it anywhere when you do have access to any heat source. 2. It is not so picky when it comes to sizes of coffee ground, grind quality, and freshness of the espresso beans. 3. Best coffee for a machine at this price range. With this information about Bialetti Brikka, many people have switched to it in the process of buying espresso machines. So what are you still waiting for, try this machine and you’ll definitely enjoy the espresso it made exclusively for you.